After a delay of one year due to the NFL preseason players’ strike in 1974, the 41st College All-Star Game was held on August 1, 1975. The Pittsburgh Steelers, having won the first championship in franchise history the preceding season, represented the professionals while John McKay of USC coached a group of All-Stars that included 22 first round draft choices. Pittsburgh, under Head Coach Chuck Noll, featured an outstanding defense and an offense that also had plenty of talent, with FB Franco Harris, the Super Bowl MVP, leading the ground attack and a good group of receivers. 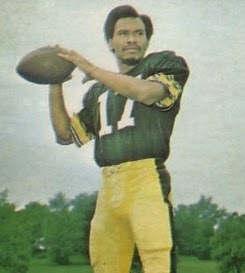 QB Terry Bradshaw had regained the starting job that Joe Gilliam (pictured above) had held for the first six games in ‘74, and displayed savvy as the team reached the top. The All-Stars included California QB Steve Bartkowski, HB Walter Payton from Jackson State, and Oregon TE Russ Francis on offense and, on defense, DT Randy White from Maryland, Jackson State LB Robert Brazile, and Ohio State CB Neal Colzie. John McKay was coaching the collegians for the second time (he had also been designated as head coach for the game that was cancelled the previous year). There were 54,562 fans in attendance on a Friday night at Soldier Field. The field was wet after a shower doused it two hours before kickoff, and it rained throughout the contest. The fired-up All-Star defense forced the pro champs to punt on the next series, but when the Steelers regained possession, they drove 87 yards in 17 plays and tied the score when Bradshaw tossed a two-yard TD pass to TE Randy Grossman at five minutes into the second quarter, Roy Gerela adding the PAT. Along the way, Pittsburgh overcame a second-and-24 hole as Bradshaw passed to WR Ron Shanklin and HB Rocky Bleier to set up a fourth-and-one situation that the quarterback converted with a plunge into the line. Bradshaw also completed passes of 20 yards to TE Larry Brown, 11 yards to Bleier, and nine to FB Reggie Harrison. On the next Pittsburgh possession, Coach Noll chose to put many backups into the game, although Bradshaw remained at quarterback. The Steelers went three-and-out and punted, but on the next play FS Glen Edwards intercepted a Bartkowski pass. Pittsburgh got a first down on the ensuing series but ended up having to punt again and, in the most exciting play of the game, DB Virgil Livers of Western Kentucky returned Bobby Walden’s kick 88 yards. The return set an All-Star Game record, and, with Mike-Mayer’s conversion, the collegians took a 14-7 lead into halftime. The pro champs were further damaged when Franco Harris and CB Mel Blount left the game with minor injuries during the first half. Still, Pittsburgh’s other starters were back for the third quarter, although they continued to have difficulty moving the ball against the tough All-Star defense. The Steelers managed to pin the All-Stars back inside their one yard line after a punt, and Neil Clabo had to kick from his end zone after the collegians went nowhere. The punt was a good one to midfield and the defense again came through, sacking Bradshaw twice to squelch any threat. The Steelers were passing more than usual, especially with Harris sidelined. With three minutes remaining in the period, Pittsburgh got the ball on a turnover when LB Jack Lambert recovered a Bartkowski fumble. On a series highlighted by two runs and a pass reception by HB John “Frenchy” Fuqua, the Steelers advanced to the All-Star 15, but then Florida LB Ralph Ortega came up with an interception that he returned to his 35. The All-Stars had difficulty on offense themselves in the second half, managing just two first downs in the third quarter and none in the fourth. Bartkowski (pictured below) stayed in the game but was victimized by dropped passes and untimely holding penalties. Joe Gilliam relieved Terry Bradshaw in the fourth quarter and the Steelers came alive on offense. Finishing off a 42-yard series, Gilliam threw to HB Rocky Bleier for a six-yard TD at less than five minutes into the final period. Then, with 4:16 left on the clock, Gilliam put the Steelers ahead with a touchdown pass to WR Frank Lewis that covered 21 yards and capped a 45-yard drive that was set up by a shanked punt. Gerela successfully added the extra points after each and, after much difficulty, Pittsburgh came away with a 21-14 win. For all of the trouble that the Steelers had on offense, they still significantly outgained the All-Stars (287 yards to 123) and had far more first downs (17 to 4). The All-Stars recorded six sacks of Pittsburgh quarterbacks to just two of the collegians by the Steelers. Terry Bradshaw completed 14 of 24 passes for 145 yards with one touchdown and one interception and Joe Gilliam was successful on five of his six throws for 50 yards and two TDs while giving up no interceptions. Rocky Bleier paced Pittsburgh’s ground game with 41 yards on 11 carries and also led the club with five pass receptions, for 41 yards and a touchdown. Larry Brown gained 45 yards on his three catches. For the All-Stars, Steve Bartkowski was successful on 7 of 18 passes for 126 yards and a TD. Russ Francis was the best of the receivers with two catches for 46 yards and Walter Payton was the leading rusher, although with only 16 yards on 7 carries. The Steelers went on to repeat as NFL Champions, putting together a 12-2 record in the regular season. While Joe Gilliam played well in relief of Terry Bradshaw against the College All-Stars, it was Bradshaw guiding the offense all the way and receiving Pro Bowl recognition for the first time. 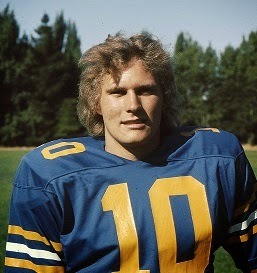 Steve Bartkowski went on to play for the Atlanta Falcons, who had taken him in the first round of the draft, and became a two-time All-Pro. Walter Payton had a great career with the Chicago Bears that ended with his topping the NFL career rushing list and gaining enshrinement in the Pro Football Hall of Fame. Pat McInally, who suffered the broken leg while scoring the game’s first touchdown, spent ten years with the Cincinnati Bengals, although he was more productive as a punter than as a pass receiver. Virgil Livers, who had the long punt return for a score, joined Walter Payton with the Bears, where he played cornerback and returned kicks for five seasons. There were concerns about the future of the All-Star Game, and only one more was played before the series that had started in 1934 came to an end. The win by the Steelers was the 30th for the pro champs, as against nine for the All-Stars and two ties (Pittsburgh also won the final contest in ’76).